Barack Obama is already being called the YouTube President because of the 1,800 YouTube videos that help propel him to win the election and have been watched more than 110 million times. 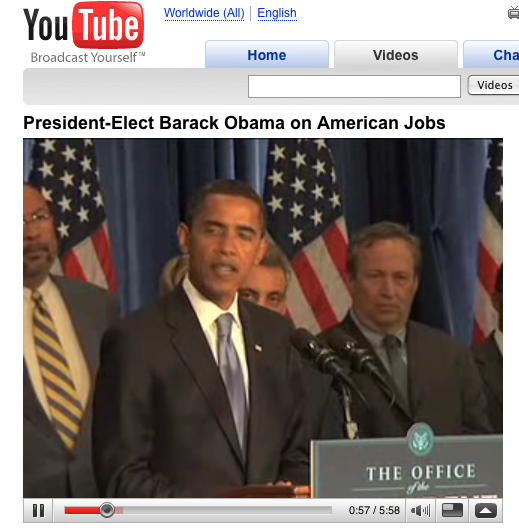 So it seems fitting that Obama will continue to use YouTube to get his message out once he takes office. The weekly radio address that every president has done since FDR will be videotaped and put onto YouTube. These “fireside chats” were started by FDR during the depression as a way to reassure Americans that everything was going to be all right. Now Obama will have some of his own reassuring to do as we grapple with the current economic crisis. The Presidential radio address is somewhat of an anachronism that Obama hopes to reinvigorate by bringing his message on-demand to people’s computers. So the weekly chat is skipping TV entirely and going straight from radio to YouTube. The address (which will still be broadcast over the radio) is usually only about four minutes long, a perfect length for YouTube. The videos will be posted on Obama.s Change.Gov website, as well as its dedicated YouTube channel. I wonder if they will ever turn comments on. Update 11/15: Here is Obama’s first YouTube address.